Advanced Coupons module is a really handy module if you want to use a flexible system of coupons. 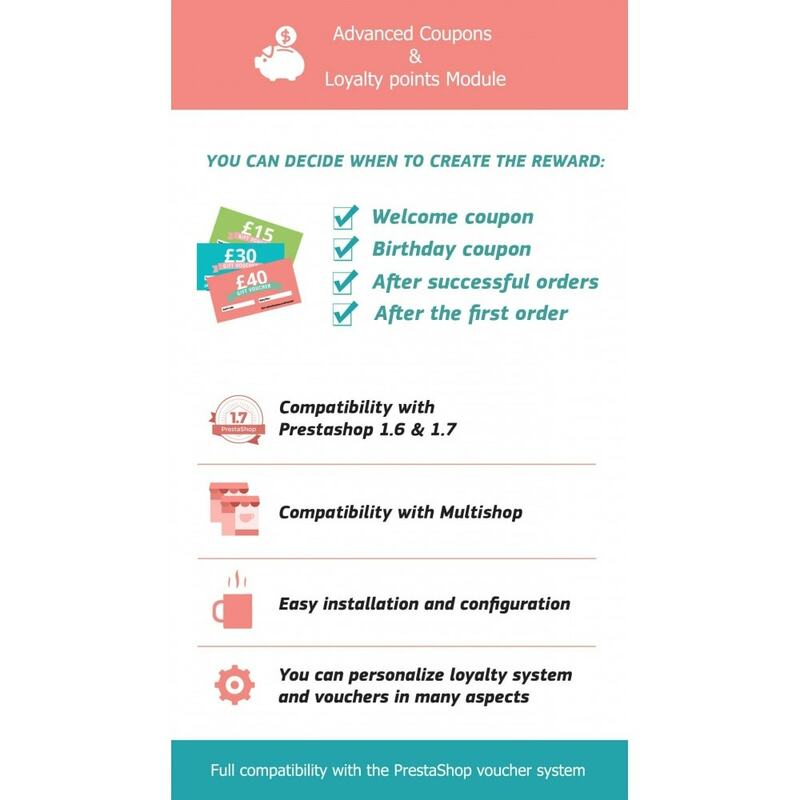 This module gives you the possibility to increase sales by custom voucher codes and points for your customers. Everyone like coupon codes! Providing a first timers offer could be just the nudge those first-time visitor needs to be converted to a paying customer. 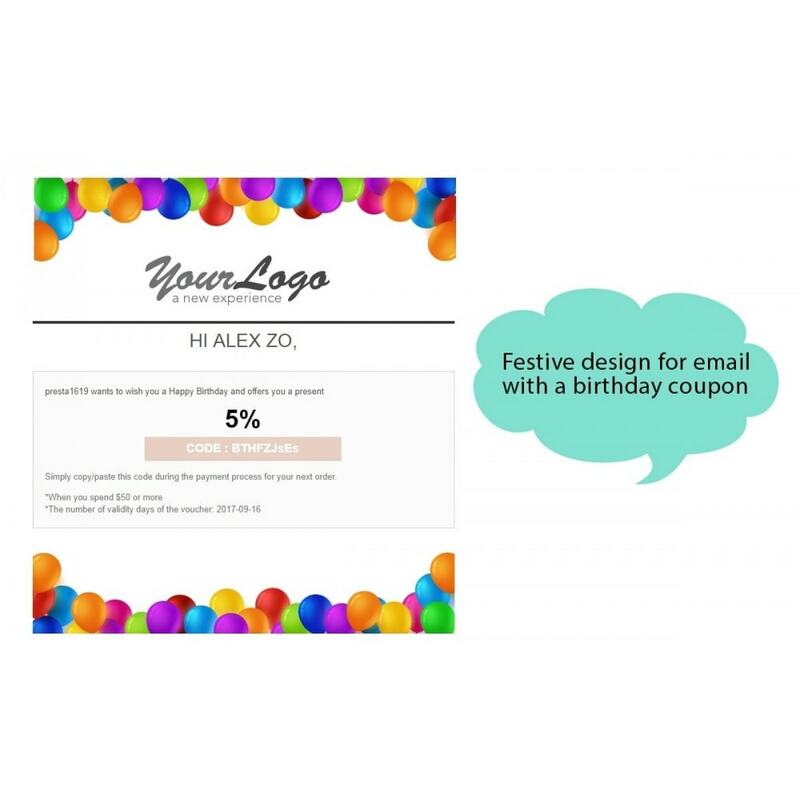 The module gives you an ability of auto sending discount notifications to customers on their birthdays. This will be a very nice surprise for your customers and they will absolutely love it. Give customers one more reason to come back! After every order, customer will receive a coupon for their next order. This way, after the first order, they will get a discount and be more motivated to come back. Unused coupons will be visible for the customer on their “My Account” page. Also a notification email will be sent to them with code, discount amount and expiration date. 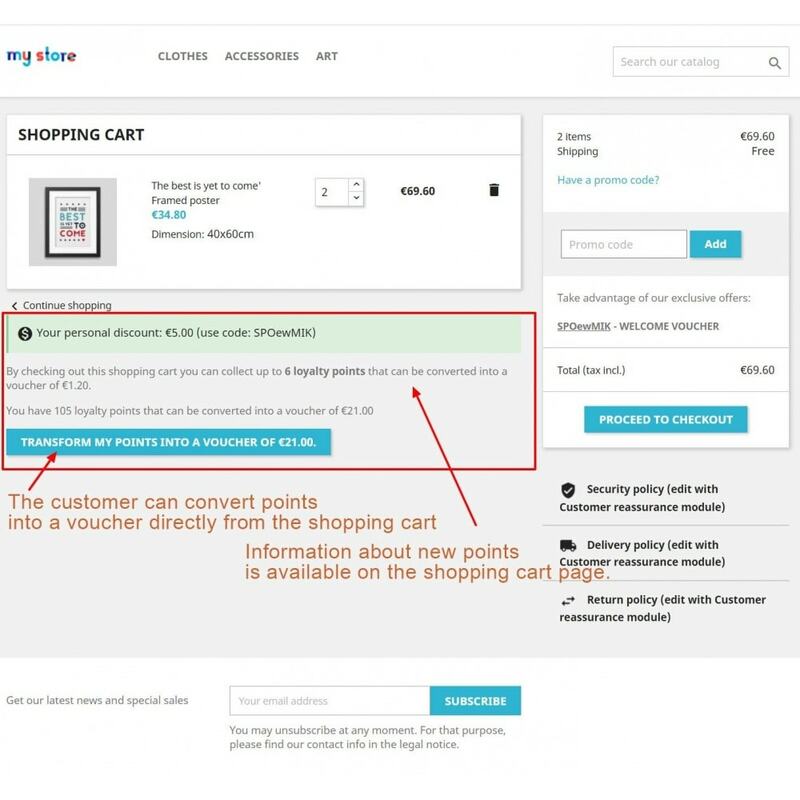 You can decide when create the voucher: when a new customer registers (welcome coupon), customer birthday, each time after successful orders and after the first order. You can set a minimum amount for order for generate voucher (If the order amount is less than $15 (eg) - a voucher will not be generated). All vouchers in “My account” – “MY VOUCHERS”. The last voucher in the shopping cart. The last voucher in the Coupon block in the left column. 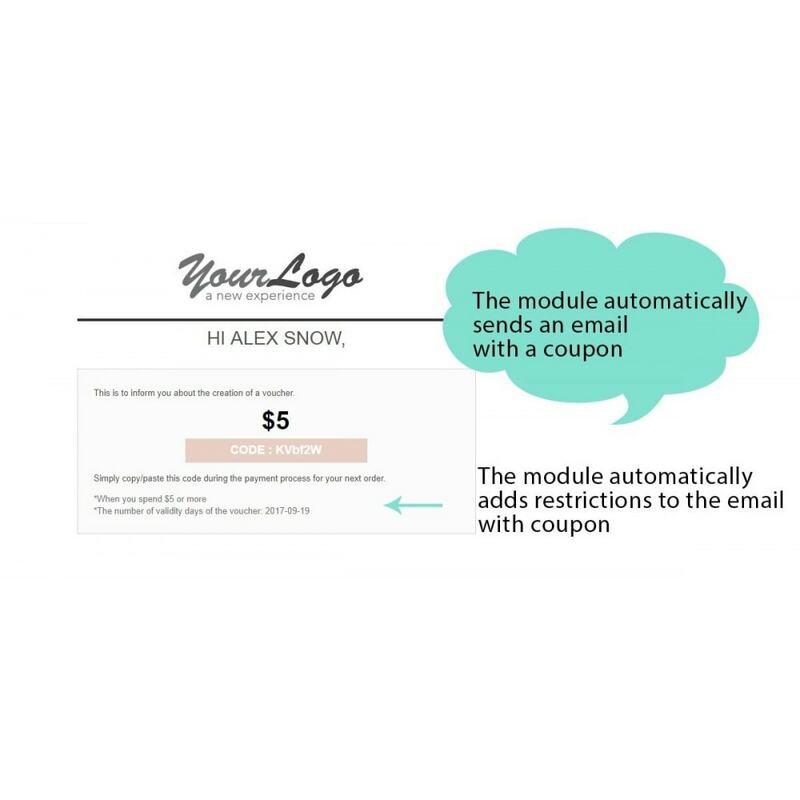 Separate email template for each coupon type. When a new user registers he will get a 10$ voucher (welcome coupon) on his next order. The user receives an email with a coupon after registration. Then he make an order (order total is 100$). He will get a 15% from the current order total (it will be 15$) on his next order. These vouchers customer can use at any time. The amount of the reward is displayed in the product page, “My account” and in the shopping cart. Then he make an order (every 10$ spent on the shop, the customer get 10 points = 1$). The customer can spend his rewards (points) to pay for any order. You can choose what to use as a reward: vouchers system or points system for each case. You can use both rewards at the same time. Superb module and superb developer!!! The programmer has acompanied us in every need, even taylor-fitting some features. I would recommend it without hesitation. Thanks!!! You can see how it works at our site https://bouttye.com Kind regards. Manuel Segarra. Works as promised, absolutely satisfied. Easy to adopt to your personal needs. Even as a newbie on the Prestashop system i did the install and setup in not more than 20min... Recomend!